PORTLAND, Ore. (PAI) – A non-profit fundraiser for the Oregon State Public Interest Research Group and its spinoff group Environment Oregon has fired two workers who helped lead a campaign to unionize. On Oct. 12, workers at the Portland call center run by the Fund for the Public Interest voted 19-5 to join Communications Workers of America Local 7901. In December, the Fund terminated Kris Humbird and Mike Schultz, who were two of the three workers elected to the union’s contract bargaining team. Fund for the Public Interest is a national non-profit organization linked to state public interest advocacy groups known as PIRGs. The Fund runs PIRG canvass operations in multiple states, and telephone outreach call centers in Boston, Sacramento, and Portland. 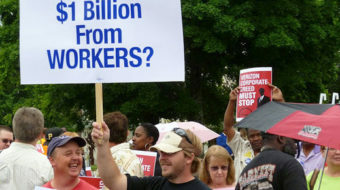 The Fund may have a history of union busting. One press account says that after Fund workers in Los Angeles voted in 2005 to unionize, management fired union supporters, refused to negotiate, and put a freeze on new hiring in the high-turnover workplace. Eleven months after the union vote, the Fund closed the Los Angeles office altogether, and moved the operation to Sacramento. Humbird says he learned of the Los Angeles case soon after he began working for the Fund six years ago, when a donor told him he would no longer give to CalPIRG because it was a union buster. After the union vote, workers say, the Fund directed the Portland office to stop calling a donor list for U.S. PIRG. It transferred that list to the Sacramento call center, and gave the Portland call center less-lucrative lists. For example, the Portland callers were made to ask for end-of-year donations from donors who’d given just months before, or were given donors to Environment Colorado who had moved out of Colorado. Soon after, three workers were placed on probation for failing to meet fundraising quotas, and a fourth worker, Schultz, was fired. As for Humbird, officially he was fired for calling in sick too late. He says that was a pretext. Local 7901 filed three charges with the National Labor Relations Board alleging the Fund broke federal labor law – for firing Humbird, changing the list, and refusing to provide information about the list after the union asked for it in bargaining. 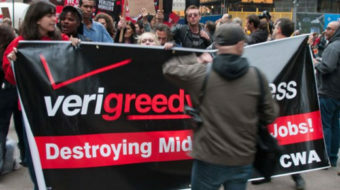 It also appears the Fund may have outsourced calling for Environment Oregon to Gordon and Schwenkmeyer Inc., a for-profit political telemarketing firm in El Segundo, Calif.
Job security was one of several motives workers had for unionizing, says Local 7901 President Madelyn Elder. Workers want a fairer pay system, she says, including more control over the quotas they’re judged by. Workers start at $8.50 an hour and can rise to $14.50. Every 80 hours, they’re evaluated. If they meet targets, their hourly pay goes up $0.50, but if they do poorly, pay can drop much more than $0.50. There are bonuses that average $40 every two weeks, depending on how much money workers raise on the phone. But workers who don’t meet the weekly quota are placed on “ultimatum,” and if they miss the quota two weeks in a row, they’re terminated – regardless of how long they’ve worked there. Workers that the Labor Press interviewed said they may work one or two four-hour shifts from 1 p.m. to 9 p.m., but are prevented from working full-time. They have no paid sick days or any other paid time off. “There’s a long history in the Fund of treating workers as if they’re disposable,” said Schultz, who was fired for missing quota. Schultz worked as a canvasser for the Fund from 2001-2005, and was in the call center six months when he was fired for missing quotas on the new list two weeks in a row. Workers have no say in choosing or preparing the call lists or setting the quotas. “I feel like I was fired because I was one of the most vocal pro-union people in the office,” Schultz told the Labor Press. The workers have set up a support page on Facebook. They also wrote a letter to the heads of OSPIRG and Environment Oregon, asking them to intervene. Humbird said their replies were nearly identical: The groups only contract with the Fund, and they believe the Fund is negotiating in good faith. 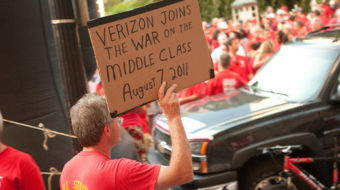 Workers also wear red CWA t-shirts on Wednesdays, and borrow tactics from Occupy Wall Street: Before a shift begins, a worker will yell, “mic check!” and co-workers will respond, setting up a group amplification system to voice complaints about the list and fired co-workers. On Dec. 15, workers and supporters picketed – and caroled -outside the Fund office in Portland. Don McIntosh is associate editor of The Northwest Labor Press. 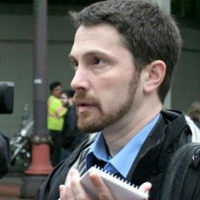 Don McIntosh is Associate Editor, The Northwest Labor Press.